A great many cabinet drawers today are constructed in two pieces, the drawer fronts and the drawer boxes. After the box is installed in the cabinet, the drawer front is then attached to the drawer box with screws driven in from the inside of the drawer and into the back of the finished solid wood front. This type of drawer construction has become popular because it's cheaper and easier to build when compared to more traditional joinery methods. It will work with either euro style or more traditional face frame cabinetry and the fronts can be made to work with inset, partial overlay or full overlay drawer styles. 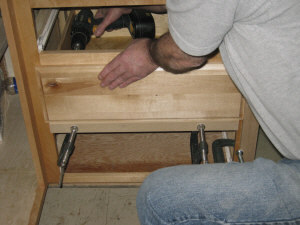 It is almost the norm to build kitchen cabinet drawers this way now and it works very well for workbench drawers also. 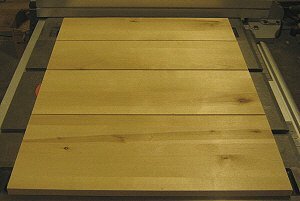 The drawer boxes for workshop drawers that will see heavy loads can be made stronger by using thicker 3/4" plywood instead of the usual 1/2" you'll find on kitchen cabinets. 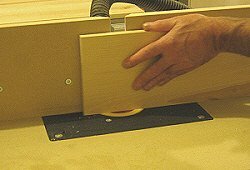 This article will cover the steps I use to make up full overlay drawer fronts from solid hardwood, create a decorative profile around the outside edge on the router table and then attach them to the drawer boxes. 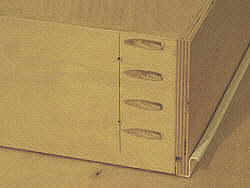 The basic steps are similar for the other drawer styles. These kitchen cabinet drawers will be going in a small town house I bought a few years ago. I really didn't want to spend a lot of money on this job, so I used up my last bit of my rough sawn birch lumber for the cabinet doors and face frames. I literally had to scrounge around the shop to find enough pieces to finish the drawers. Panels for the drawer fronts are glued up from several narrow pieces. The town houses were built in the early 1970's and the kitchen cabinets looked original. The base cabinets looked to be built in place as one single unit and were a mixture of 1/2" and 3/4" plywood. They were a euro style with mdf doors and drawer fronts and I must say, quite ugly to look at. The face frame was added to stiffen up the structure and improve the appearance. I used glue and pocket hole screws to attach it to the cabinet. 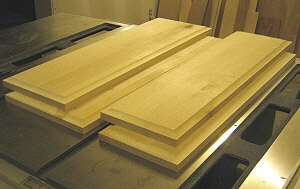 Most solid wood panels are usually glued up from several narrower pieces and drawer fronts are no different. There is less chance of them cupping or warping this way because the end grain pattern can be alternated from board to board. I like to glue up the panels an inch wider and about four inches longer than finished size. The thickness is about 15/16" on these boards after planing them all to the same size, which will leave me plenty of material to take them down to 3/4" after the glue has set. The extra length lets me trim out any snipe produced by the planer. Panels are planed to thickness and then trimmed to their final dimensions. Once the glue has dried overnight, I run the panels through the planer, flipping them after each cut until I reach my thickness of 3/4". It's wise to inspect the panels between cuts though, just in case one side needs more attention than the other. Next the panels are trimmed to their final height on the table saw. I'll usually take a cut off both edges to get rid of any marks left by the clamps. A combination blade works fine here. The last step is to cut them to width. My crosscut sled does an excellent job of trimming small panels like these perfectly square. I like to swap out the blade for an 80 tooth finishing blade for this cut, which leaves a really nice finish on the end grain. If you don't have access to a planer and jointer, it's still possible to make these panels by gluing up pre-surfaced stock from your local wood supplier. Careful clamping, so that the edges mate very close, will leave you with a panel that can be sanded down almost perfectly flat. The edges can be jointed on the table saw with a table saw jointing jig and a quality blade like the Freud glue line rip blade . Routing a decorative profile on the outside edge of the drawer fronts will give them a more pleasing look and lessen the chances of chipping the edges in rough environments like kitchens and workshops. A vertical panel raising bit. There are many router bit profiles that are suitable for this job. Personal preference and tastes are different for everyone, so whatever you choose, just make sure it appeals to you. This also goes for whether or not you want the profile to match the doors on your cabinet if you have any. 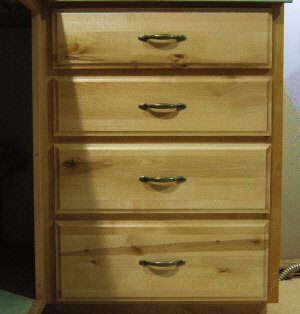 For these drawers, I chose a shallow cove profile that's easy to produce and easy to sand. A full radius cove also works well, but I prefer the looks of the more gradual curve that a vertical panel raising bit leaves. 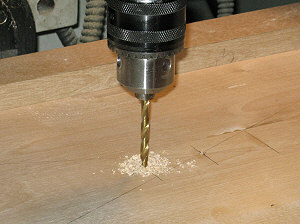 A router table is a must when working with this kind of router bit. 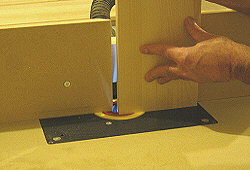 If you don't have a router table, a regular coving bit with a bearing will make a similar cut. Just replace the bearing with a larger diameter one to control the amount of material removed from the edge thickness. Once I get the shape I want on this test piece, I can then use it to set the router bit height on the last cut. To figure out the depth and width of the cut, I used a piece of scrap birch and gradually removed material until I reached the shape I was after. This involved moving the fence in a little at a time to find the depth and adjusting the height of the router bit to get the width. The actual measurements on this cut turned out to be just shy of 1/4" deep (about 13/64") and 1/2" wide. It's important that you don't move the fence after you get the desired profile. Instead, the router bit will be lowered for the first pass and then raised a bit for each additional pass until the full width of the cut is reached. I finished these with four passes. The last pass was more of a clean-up cut, with very little material removed. This leaves a nicer finish and is much easier to sand out later. Always start your cut going with the grain to minimize tear out. Flip the drawer front counter-clockwise and make the next cut. The trick to avoiding tear out in panels like these is to always start going with the grain. After this first cut, turn the panel counter-clockwise and make another cut on the end grain. The cut will terminate where you started the first cut, practically eliminating any tear out. With the routing completed, the panels will be sanded down to 220 grit. 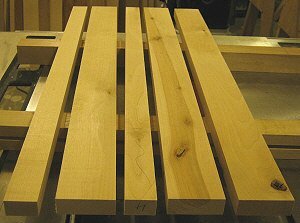 Do all four sides on each panel before increasing the height of the router bit for the next pass. 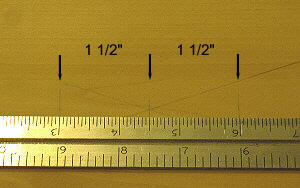 The test peice can be used to guage your progress and to set the height for the final cut. After the routing is complete, I usually sand the panels down to 220 grit, starting with 60 grit and working my way up. They will be finish sanded down to 400 grit after the holes are drilled for the drawer pulls. Wrapping sandpaper around an ordinary kitchen sponge works great for sanding out the routed cove. A random orbital sander works best for the flat surfaces, but a small palm sander can do a pretty decent job also. It's much easier to drill the mounting holes for drawer pulls before the drawer fronts are attached to the drawer boxes. After the panels are attached to the boxes, the pre-drilled holes will guide the drill bit through the plywood on the front of the box. Drawing lines across the diagonals will mark the center of the panel where the lines cross. You should already have your drawer pulls or at least know the center spacing for the ones you want. The most common size is 3" on center, but there are many other sizes available, so make sure you know the center spacing before drilling any holes. The screws that come with the drawer pulls will likely be too short to go through both the panel and the 1/2" plywood of the drawer box. 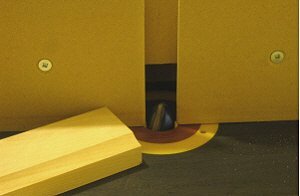 Standard screws are usually 1" in length, so if you add 1/2" to compensate for the thickness of the plywood, 1 1/2" screws should do the trick. Most standard pulls use a #8 x 32 tpi (threads per inch) machine screw and can be sourced from most any hardware store, but it's a good idea to take along one of the original screws to make sure you get a match. 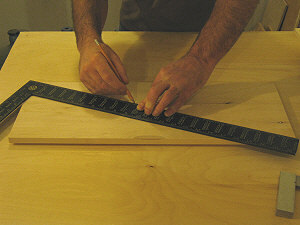 For 3" pulls, measure over 1 1/2" on both sides of the panel center and use a square to mark a line down from the top edge. To find the center of the panel draw lines from corner to corner on the back of the drawer front as shown in the above photo. If you only need one hole for a knob, you can center punch where the lines cross. For drawer pulls that require two screw holes, measure over one half the screw center distance of the drawer pull and make a mark on each side of the panel center. Use a square and draw a short line down from the top of the drawer front at each mark in the approximate center. I like to use a fence rigged up to the drill press to drill the mounting holes. Once the fence is adjusted to the center of the drawer front, the panel is simply slid along the fence to the drawer pull center lines that were drawn earlier. This will insure your drawer pulls are parallel with the top edge of the panel. Using a fence on the drill press keeps both holes perfectly parallel with the top edge. To help avoid loose handles or misalignment down the road, I drill the holes to 11/64", which is just big enough to let the screws pass through. This makes it important to drill the holes dead center on the lines. I get the best results by just eye-balling the drill bit with the line and with the drill press running, slightly touch the drill bit to the wood. This leaves a small indent in the wood that tells me if I'm centered in relation to the line. If it's off a bit, the drawer front is readjusted along the fence and then I'll sort of tap the drill bit lightly on the wood a few times again to form a new indent. Once aligned, drill through the drawer front and repeat for the other hole. Now I'll finish sand the panels to 320 and then 400 grit to remove any light scratches and prepare them for whatever finish I'm applying. The 400 grit is done by hand, going with the grain as much as possible. After staining with a light golden pecan color, I sprayed them with a satin poly clear coat. As mentioned at the beginning of this article, the drawer fronts are attached to the drawer boxes with wood screws from inside the drawer box. Because the boxes will be installed in the cabinet first and the drawer front attached while the drawer is closed, it can be difficult to align the screws to pencil marks and get the screws started straight. Drill pilot holes in the box's front panel for the mounting screws. To make things go easier, I pre-drill pilot holes in the front of the drawer box for the #8 x 1" wood screws. The pilot hole is smaller than the screw (3/32"), allowing me to start the screw in the hole before driving it in with the drill. For most drawers, a screw is placed in each corner in a position that will allow me to use a cordless drill to drive in the screws. For deeper drawers, four holes are required. Really shallow drawers like those used in side tables and small desks usually only need one on each side, centered in the depth of the drawer. Because the screws for the drawer pulls will also be installed from inside the drawer box, there is no need for wood screws in the center of the box. The pilot holes are countersunk from the inside of the drawer box. Countersinking the holes from inside the box will allow the head of the screws to sit flush with the plywood and make them less visible for a cleaner look. Before the drawer fronts are attached, it's important to have the boxes properly installed in the cabinet. For face frame cabinets, I use a straight edge to make sure the front of the box is even all around with the face frame with the drawer pulled flush. At this point in the installation process, the only screws I have used to secure the drawer slides in the cabinet are in the vertical slotted adjustment holes. I only install the rest of the screws once the drawer fronts are installed and I'm sure they close perfectly flat against the face frame. Clamp straight guide boards on the face frame to align drawer front. When drawers are stacked in a column like this, it's really important to get all the edges on the same plane. The easiest way to accomplish this is using a straight board clamped to the cabinet that runs from the top of the top drawer to the bottom of the bottom drawer. 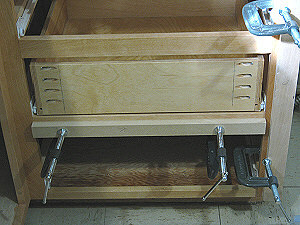 Because these drawer fronts will overlay the face frame 1/2" all around, the guide board is clamped 1/2" from the side of the opening top to bottom. Once this board is clamped properly, it's not removed until all the fronts are attached. On a cabinet that isn't installed yet, I'll use bar clamps from front to back, but since this cabinet was already in place, I had no where to clamp except the face frame. I had to keep moving the c-clamps around as I progressed, making sure that there were always at least two clamps on at all times. Screws are driven in from inside the box while holding the panel against the guides. A second straight edge is clamped on the face frame under the drawer front. This one also needs to allow for the 1/2" overlay. This straight edge is moved to the next drawer after each front is installed. With the panel held firmly against the two guides, you can reach in one of the other drawer openings with your cordless drill and run in a screw on each side with your other hand. Now, it's just a matter of pulling the drawer open and driving in the other two screws. If you're using standard Blum drawer slides like the ones here, make sure you push the drawer box flat against the back of the drawer front before you drive in the first screw. The reason is that these slides have a bit of a ramp on the part that installs in the cabinet. This ramp allows them to close by themselves in the last inch or so. 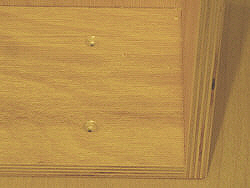 Use the holes that were pre-drilled in the drawer front to guide the drill through the plywood and mount the pulls. If these slides are mounted right, the drawer box will be set back slightly from the front of the face frame. But, even this small amount can create a problem if the drawer box is not pushed against the back of the front panel. The top drawer was a bit of a problem because the countertop was still on. This is quite common in kitchen cabinet refacing jobs. My work around is to set the front on the guides as usual, and then drill through the holes for the drawer pull in the drawer front, right through the drawer box. Use the same drill bit you used to drill the holes in the drawer front earlier. Reach under the drawer box to pull it up against the front before drilling the holes. Once they're drilled, mount the front by attaching the drawer pull and snug up the screws. Close the drawer carefully and make sure it's flush with the guides before driving in the wood screws. After making sure the drawers close flush all around the face frame, the rest of the screws are installed in the drawer slide halves inside the cabinet. Mount the rest of the drawer pulls and this job is history. They turned out pretty nice considering I didn't have much choice of wood selection. The few knots just add character and without the glare of the camera flash, they look even better than the photo. Building cabinet doors with basic table saw techniques.